Open Source Storage: Distributed Storage - too complicated to try? Distributed Storage - too complicated to try? The thing about distributed storage is that all the pieces that make the magic happen are.....well, distributed! The distributed nature of the components can represent a significant hurdle for people looking to evaluate whether distributed storage is right for them. Not only do people have to set up multiple servers, but they also have to get to grips with services/daemons, new terms and potentially clustering complexity. Well the first thing is to look for a distributed storage architecture that tries to make things simple in the first place...life's too short for unnecessary complexity. The next question is "Does the platform provide an easy to use and understand" deployment tool?" So the key thing is to deliver usable capacity as quickly and as pain-free as possible - whilst ensuring that the storage platform is configured correctly. Now I could proceed to show you a succession of screenshots of gluster-deploy in action - but to prevent 'death-by-screenshot' syndrome, I'll refrain from that and just pick out the highlights. 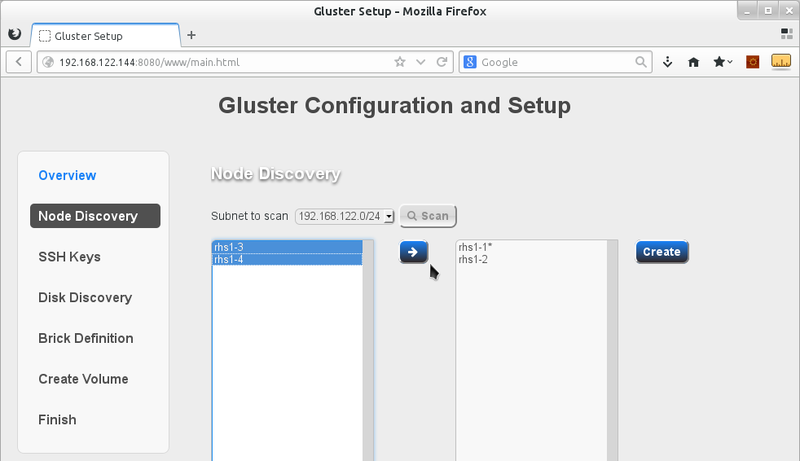 I wont cover installing the gluster rpms, but I will point out that if you're using fedora - they are in the standard repository and if you're not using fedora, head on over to the gluster download site download.gluster.org. Ok. So there is some tweaking we can do but for now, let's just run it. Taking the URL displayed in the CLI, and pasting into a browser, starts the configuration process. The deployment tool basically walks through a series of pages that gather some information about how we'd like our cluster and storage to look. Once the information is gathered, the tool then does all the leg-work across the cluster nodes to complete the configuration, resulting in a working cluster and a volume ready to receive application data. NB When you choose to use snapshot support (lvm with dm-thinp or btrfs), confirmation is required since these are 'future' features, typically there for developers. Now, let's take a closer look at what you can expect to see during these phases. The image above shows the results from the subnet scan. 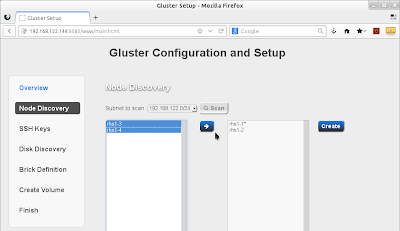 Four nodes have been discovered on the selected subnet that have gluster running on them. You then select which nodes you want from the left hand 'box' and click the 'arrow' icon to add them to the cluster nodes. Once you're happy, click 'Create'. Passwordless login is a feature of ssh, which enables remote login by shared public keys. This capability is used by the tool to enable automation across the nodes. With the public keys in place, the tool can scan for 'free' disks. Clicking on the "Build Bricks" button, initiates a format process across the servers to prepare the disks, building the low-level filesystem and updating the node's filesystem table (fstab). 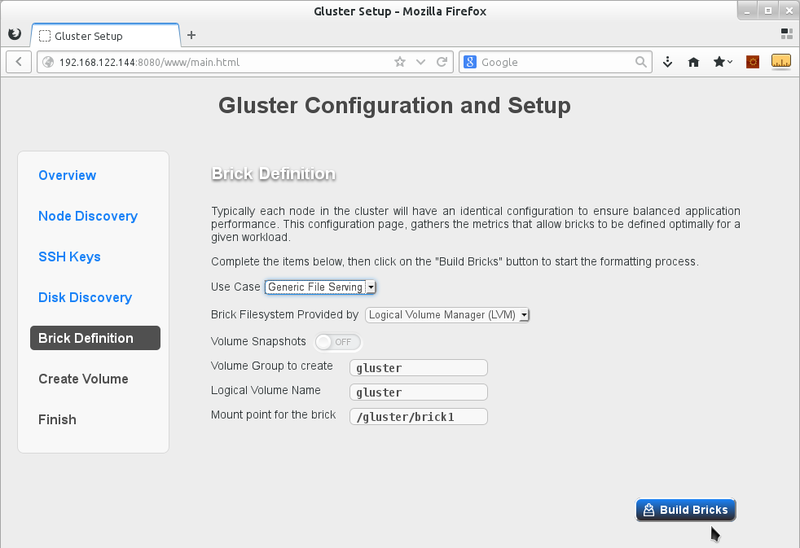 These bricks then become the component parts of the gluster volume that get's mounted by the users or applications. Volumes can be tuned/optimised for different workloads, so the tool has a number of presets to choose from. Choose a 'Use case' that best fits your workload, and then a volume type (distributed or replicated) that meets your data availability requirements. Now you can see a list of bricks on the left and an empty table on the right. Select which bricks you want in the volume and click the arrow to add them to the table. A Volume Summary is presented at the bottom of the page showing you what will be built (space usable, brick count, fault tolerance). Once you're happy, simply click the "Create" button. 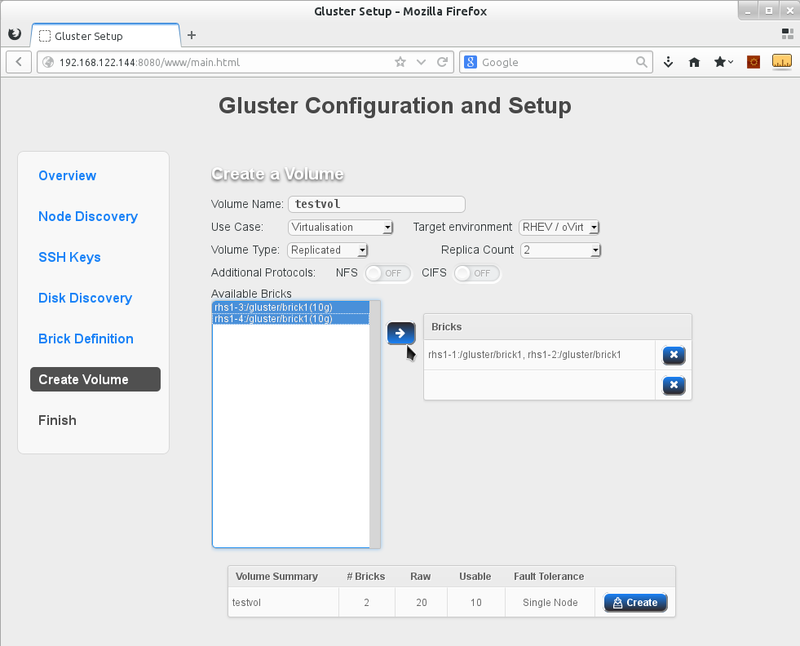 So, if you can use a mouse and a web browser, you can now configure and enjoy the gluster distributed filesystem : no drama...no stress...no excuses! For a closer look at the tool's workflow, I've posted a video to youtube. 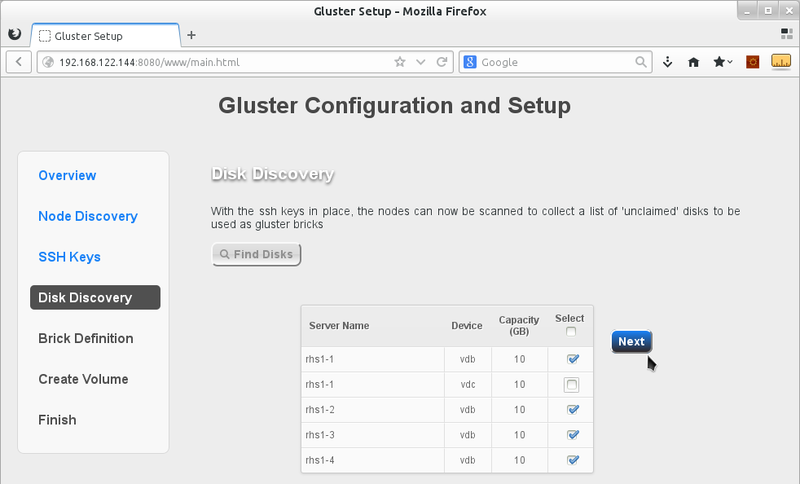 In a future post, I'll show you how to use foreman to simplify the provisioning of the gluster nodes themselves.